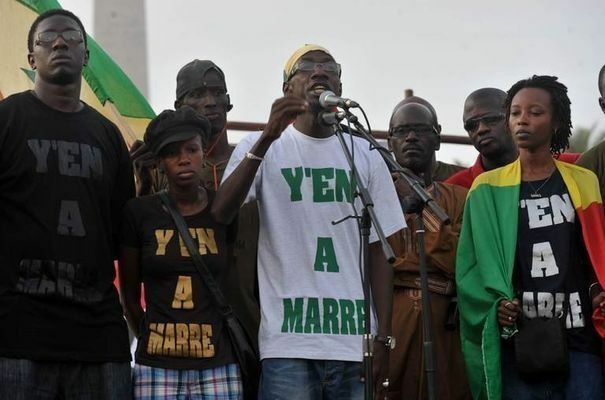 Participants in the “Y’en Marre” protest movement in Senegal. Of the numerous concepts which have influenced Black Africa since the wave of independence in the 1960s, pan-Africanism is, after democracy, probably the most popular. Paradoxically, the continent remains the least integrated in the world and continues to experience outbreaks of xenophobic violence. Historically, the first pan-African movement, founded in the late 19th century, was a search for a common identity: “˜pan-Negrism’. The aim was to unite black people across the world in order to fight slavery and colonialism. Pioneers were Edward Blyden, WEB Dubois, Stokely Carmichael and Kwame Nkrumah. Pan-Africanism developed into a machine to advocate for African unity by tackling common issues affecting the continent. After that, pan-Africanism inspired the creation of the Organization of African Unity (OAU) in 1963, which became the African Union in 2002 and different pan-African institutions such as the African Development Bank, the African Court on Human and People’s Rights, the African Court of Justice, etc. For many Africans today, beyond the question of identity, which remains relevant, pan-Africanism has shifted more to a quest for democracy and good governance. This article analyzes the contradiction between the growth of pan-African ideology in black Africa and the persistence of intra-African conflicts and xenophobia. When travelling in many African countries it is often striking to see how many young people feel attached to the concepts of African identity and African unity. In Cí´te d’Ivoire, Senegal and Cameroon, to give just three examples, pan-Africanism has become something close to a religion. As the power of globalization continues to weaken boundaries of statehood, many young people in Africa are increasingly becoming aware of their own political and economic environment. It is in this regard that pan-Africanism has found a viable niche for renewal in the 21st century among an educated grouping of middle-class Africans. Rather than focusing only on identity, this “˜new’ pan-Africanism is also a call for democracy, good governance and economic development. The renewal of this pan-African attitude is manifested through increased intra-African trade, increased exchanges within Africa’s universities, continent-wide calls for good governance and the ubiquitous and growing membership of pan-Africanist groups on social media platforms. Dreaming of a brighter future, most young people are tired of dictatorial leaders who have clung to power since independence. Recently in Burkina Faso, many people rose up against former president Compaoré, eventually forcing him to exit from power. In Tunisia, young people rose up against decades of repression and poor governance under President Ben Ali. The quest for freedom amongst African youth led to the establishment of associations such as “Y’en a Marre” in Senegal, “Balai Citoyen” in Burkina Faso, “Filimbi” and “La Lucha” in the DRC and “Ca Suffit comme ca” in Gabon and the Pan African Youth Union (PYU) which operates under the AU with a specific mandate of gathering and rallying young Africans to realize the organisation’s ideals. In March 2015, the spirit of “Y’en a marre” and “Balai citoyen” converged in the DRC to mobilize the local population to become more committed to promoting change throughout the country after it became obvious to them that President Joseph Kabila is seeking to stay in power by any means. They organized conferences in Kinshasa with local civil society and shared lessons drawn from their experiences in civic engagement. African young people have also been at the forefront, forging continental unity through cross-border travel and social media. In this digital era, social media has turned into a popular platform to interact and engage in debates. For instance, as South Sudan recently plunged into political in-fighting and the Central African Republic was on the brink of a religious conflict, twitter hash tags and Facebook posts were used to convey messages of peace. On Facebook alone there are hundreds of pan-African groups. Some are popular with thousands of members; such has the Pan-African Network, the Pan-African Movement Reborn, “˜Pan-African Fundamentalism’, “˜Being Pan-African’, the Center of Pan-African Culture, etc. etc. The increasing use of common languages is also an indication of the rebirth of pan-Africanism. A large number of people are learning French, English and Portuguese, which are the official languages of the African Union, in order to facilitate communication with their counterparts from other sub-regions. In the East African region, there is a growing use of Kiswahili. Young people in Africa have seen so many “˜pan-African presidents’ remain in power for decades without experiencing any development for their nations. They are tired of those who use the pan-African rhetoric for their own interest. If the previous iteration of pan-Africanism was a hymn to African identity and African unity, today the concerns of pan-African youths are democracy and economic development. The main paradox of present-day pan-Africanism is the growth of xenophobic violence, for example in South Africa, and difficulties encountered moving from one country to another within the continent. Visas are still required for an African to travel within the continent, even within some sub-regions like ECCAS. Despite the small increase in intra-African trade, most of Africa’s trade is still done with Europe and Asia. Philosophically, pan-Africanism is a laudable idea: gather people of the continent together for the benefit of all. But, the trap is when some politicians use it to build an authoritarian system. Real Pan-Africanism must result in tangible fruits of development, democracy and a real solidarity amid African countries. The author is Sub-Saharan Africa Political and Security Analyst. The level of intra-African trade has increased both in nominal and real terms. In nominal terms, the level of intra-African trade was $32 billion in 2000 and $130 billion in 2011. In real terms (at constant 2000 prices) intra-African trade increased from $32 billion in 2000 to $54 billion in 2011.. See UNCTAD, Intra-African trade: unlocking private sector dynamism, Africa report 2013, 2013, p. 125. Kaddafi wasn’t Black African, so why bring him into a pan-African discussion about Black Africans? Gaddafi was not popular. The flamboyant rebellion that he represented was popular. The distain for the West that he once presented was popular. Gaddafi claimed for himself ideas of pan-africanism already formulated by African and Caribbean leaders. He was a mirage, just an appealing mirage. I just began to read the article and noticed some inaccurate information. Kwame TurÃ© or Stokley Carmichael, as you refer to him was not alive in the late 19th century. Also, he was a black revolutionary who fought for an end to the American apartheid system. I think it is problematic to lump these persons together because while they may share the same goal the way this wished to achieve was in some cases at odds. There is precious little material of substance in this anonymous piece. Also, the listing of pan-African pioneers is in itself paradoxical! Stokely Carmichael was born in 1941, over 100 years after Edward Blyden. Difficult to see how Carmichael can be called a pioneer of pan-Africanism as he was four years old when the 5th pan-African Congress was held. Qaddafi wasn’t Black African, it is true. But it is seen by many Black African, especially young people, like the champion of pan-Africanism: the man who wanted to create the African Monetary Fund, the man who funded AU, the man who raised against the hegemony of the West in Africa. That is the point. The color is not important, he is clearly perceived as a champion of pan-Africanism by a significant portion of Black Africans. Like they are Kwame Nkrumah and Cheikh Anta Diop associations in some high schools in Kenya, Senegal, Cameroon, Qaddafi associations have been created in some high schools in Kenya and Cameroon and I’m pretty sure that if we search in the other countries we’ll observe the same. Yes Qaddafi has provoked and fueled some wars in Africa, yes he has used pan-Africanism, after pan-Arabism, for his own interest. But the point is that he is perceived by a portion of population like a champion of pan-Africanism and it was important to mention that.